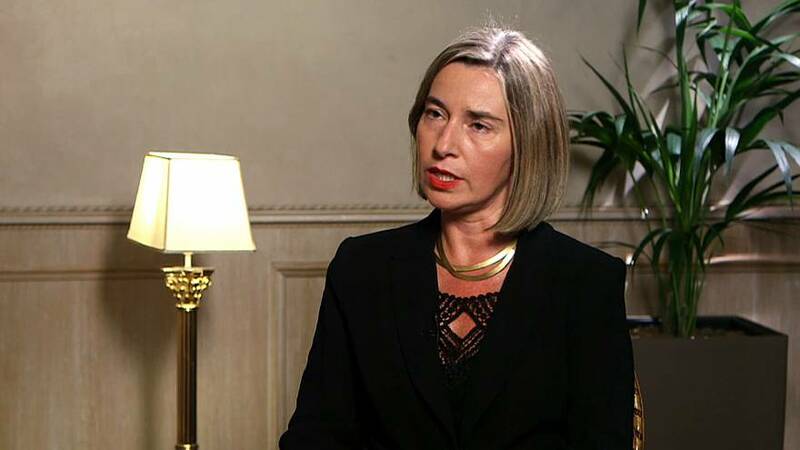 From the Iran nuclear deal to strategy with Africa on fighting illegal immigration, Euronews has been discussing a host of issues with EU foreign policy chief Federica Mogherini. We met her at the MED 2017 - Mediterrean Dialogues conference in Rome. And to whet your appetite for an upcoming extended interview, here is an extract of her conversation with our Editor-in-Chief Gardenia Trezzini. Mogherini was asked about the relationship between the Trump administration and Brussels. "I sometimes think of Kissinger's wisecrack when he asked for Europe's telephone number," she chuckled. "Now the USA has Europe's number but it is our turn sometimes to ask what Washington's telephone number is! "But we talk to each other very often. We still work together very well on a lot of issues." We wondered about US-EU exchanges on North Korea. Mogherini firmly rejected any suggestion that European diplomacy has been reserved on the North Korean question. "Quite the contrary! We were the first to apply all the sanctions decided on by the United Nations. We were also the first to add, on our own initiative, elements of economic pressure on Pyongyang, very quickly and in coordination with our American partners and especially with those in the region. "We coordinate each step of our action with Washington, Seoul, Tokyo but also with Beijing and Moscow," she said. "Only unity from the international community and the UN Security Council can open a way to negotiation with North Korea and this joint effort must include the work that especially China can do in the current situation to open a diplomatic channel that today is non-extistant."